Lady Frances Ffolkes is incensed when she finds out that her dear friends Gwendolyn and Thomasina have been subject to vicious threats. Promising to uncover their attacker, she travels with them to Kestrel's Eyrie, the fabled estate belonging to Gwen's family. But soon Frances faces an even greater problem, when Gwen's father, a powerful diplomat, is stabbed to death with his prized ruby dagger. Frances, with her loyal maid June Mallow at her side, jumps right into interrogating the estate's numbered guests: a charming Turkish diplomat with a habit of sneaking off into the night, a brash American heiress with lofty dreams of becoming mistress of the Eyrie, two gossiping widows with their own scandalous secrets, and Gwen's own aunt tasked with keeping the affairs of the estate in order among the chaos of the investigation. But as the case unfolds, Frances' righteous conviction might just be the very thing that leads danger-and even more death-to her own doorstep. 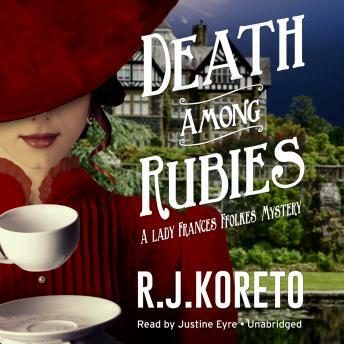 Old sins do indeed cast long shadows in Death among Rubies, a delightful closed-room mystery in the vein of Agatha Christie and the second in R. J. Koreto's effortlessly charming historical series.